Yousaf has been MSP for Glasgow Pollock since May 2016, having previously served as a regional MSP for Glasgow since 2011. Yousaf currently serves as Cabinet Secretary for Justice in the Scottish government, having been Minister for Transport and the Islands until June 2018. He was born in Glasgow and completed a degree in Politics at the University of Glasgow in 2007. Following this, he worked in the Scottish Parliament as an aide to the late Bashir Ahmad. He is also an alumnus of the US State Department's prestigious International Visitor Learning Programme. He was elected as an MSP for the Glasgow region in May 2011, making him the youngest person to be elected to the Scottish parliament. He was also appointed as a Parliamentary Liaison Officer to former First Minister Alex Salmond MSP until September 2012. 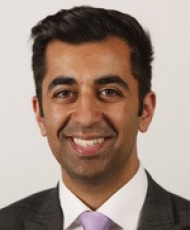 Yousaf became MSP for Glasgow Pollock in May 2016 after winning 58.4% of the vote, taking the seat from Labour’s Johan Lamont, who had been MSP since 1999. Yousaf’s political interests lie in civil liberties, equality, tackling poverty and Scotland's role in the global world.